Creating a fast and delicious meal. Heat the olive oil in a nonstick skillet and add the cubes of chicken. Add salt and pepper and brown the chicken patiently on all sides. Add the onion and pepper and continue sautéing until vegetables are tender. Pour the tomato and after two minutes you pull the pan from the heat. Add the parsley and stir well. Continue by making the sauce. Put a saucepan over medium heat and stir the butter with the flour until butter is melted and lightly cooked. Then add milk and continue stirring until the cream boils and thickens. Remove the saucepan from the heat, add the egg and stir vigorously. Finally, mix the grated cheese in the bechamel sauce, add the nutmeg and salt and pepper on top. Allow the sauce to cool slightly and add to the chicken mixture. Preheat oven to 190 ° C.
Take one by one the crepes and put 1/8 of the mixture along to the center of the crepe. Fold left and right of the crepe in and after the wrap roll. Place them on an oiled baking pan and continue this process with all the crepes. 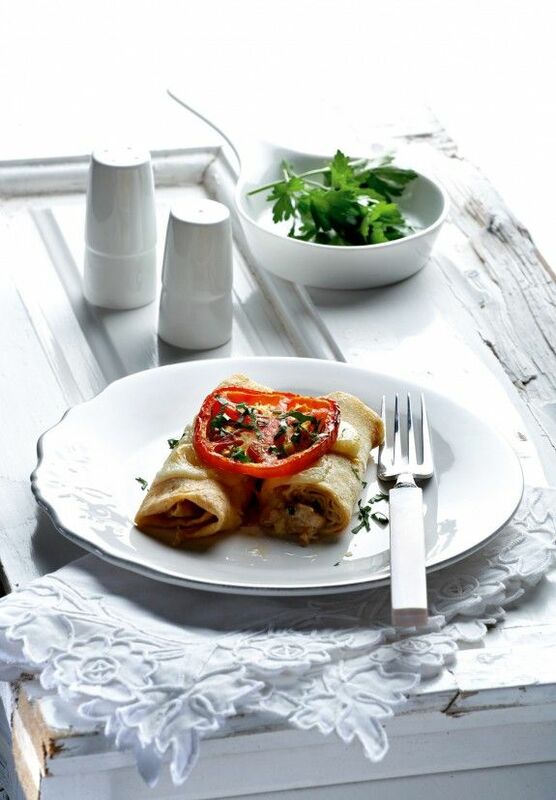 Place a slice of cheese and one slice of tomato on each pair of crepes. Lightly salt the tomatoes and cook the crepes until the cheese melts and get some color. Serve the crepes warm, counting two in each serving and sprinkle with a little chopped parsley.